A shield or dhal painted with floral designs in gold, black and red, some of which are slightly raised from the surface. The surface of the shield is finished with a clear varnish that gives the shield an appearance of Japanese-style lacquer. 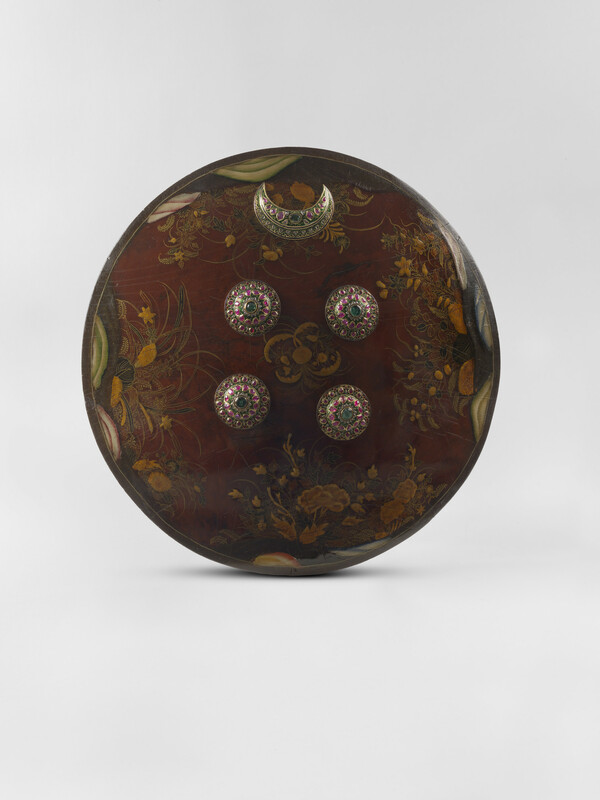 In the seventeenth century, Portuguese merchants based in the subcontinent sent Indian objects, such as shields, to Japan to be decorated with lacquer. These objects were subsequently presented in India as diplomatic gifts or sent to Portugal. The decoration of these objects lacquered in Japan appears to have influenced Indian craftsmen in the nineteenth century. During the Prince of Wales's tour of India, he received several shields decorated with similar designs from rulers based in modern-day Rajasthan suggesting that they were made in one workshop. The shield is further ornamented with four green-enamelled gold bosses and crescent, encrusted with emeralds, rubies and diamonds. One of the bosses is inset with an emerald incised with a floral motif suggesting that some of the jewels used for the shield's mounts were repurposed from other jewelled objects.